All wooden signs need to to be cared for if they are going to last. It is important to keep the water out and protect against UV, fungus and algae. It is the situation the sign or memorial is placed in, that determines how often you must re-treat the timber. The only timbers which need little care are those high in oil eg Iroko, Red Cedar, Balau and Opepe. Please note - all varnished and oiled signs are hung to be sprayed so you will notice a small hole in the reverse of a single sided sign, and if it is a double sided sign, the hole will be on the top edge and will be filled after spraying. We treated all wooden signs with a fungicide before treating with oil or varnish. All varnished signs are also treated with a final coating of wood care milk to prolong the lifespan. 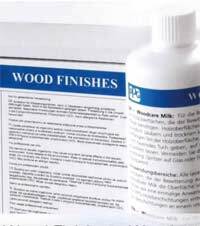 PPG woodcare milk has been design to extend the life of a varnished sign by adding a colourless sacrificial coating over the varnish. This helps extend the period between renovations and protect from damage from dirt scratches or hailstones. It helps prevent moisture ingress which in turn increase the life of the sign. 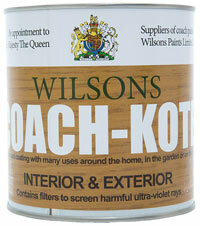 Coach-Kote is not just a high quality varnish but also a clear coach enamel. But that doesn’t say enough, Coach-Kote is a ‘long oil resin’ based product which means it has a long molecular structure giving it much more durability, flexibility and toughness than any other varnish. Ideal for exposed situations and on boats. This product is a clear version of the coach enamel used on the queens carriages at Buckingham Palace. Not only that and unlike most other varnishes a UV filter has been added so Coach-Kote gives even better protection especially when used outside. This product is unlike any of the commercial wood oils from the well known large companies as it uses more expensive raw materials chosen for their eco credentials. one of the main ingredients is pure turpentine from the turpentine tree instead of using petroleum solvents. There is also an ultra-violet filter added and this is not found in most proprietary brands. When using on bare, previously untreated wood simply apply 1 generous coat, leave for 10 minutes to soak in and then wipe off any excess with a dry cloth. Will need treating at least twice a year. 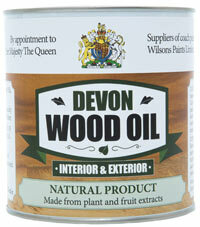 A superior blend of natural oils and resins that penetrates into the wood to nourish, feed and protect. It gives a tough, durable and waterproof finish which brings out the beauty of the timber. It leaves a natural, open grained, soft lustrous finish. It is suitable for all timbers and easy to use - just wipe on with a cloth. The only disadvantage is the timber will need to be treated 3 - 4 times a year. 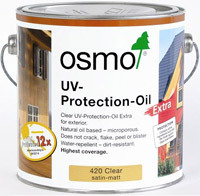 Osmo UV-Protection-Oil Extra, based on natural vegetable oils is micro-porous, and does not crack, flake, peel or blister. The natural oils penetrate deeply into the wood, keeping it elastic and healthy, and preventing it from drying and becoming brittle. The wood is allowed to breathe, yet is protected against the elements with a clear satin-matt finish. It also blocks the greying process by UV-Protection factor 12 in comparison to untreated wood and it contains active ingredients for protection against algae and fungal decay. 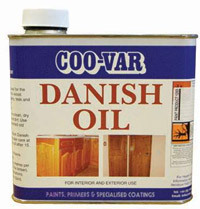 It also has the advantage of less treatments than Danish Oil - a once a year treatment is usually sufficient to maintain your sign (in shelter sites - every two years).